To celebrate the launch of The Dark Knight Online Slot game, Ladbrokes Casino is giving away FREE £5 no deposit bonus for a limited time only for all new customers. There are HUNDREDS of slot games available to use the £5 no deposit bonus; including the popular Thunderstruck 2, Mermaid Millions and Mega Moohlah Isis. This fantastic offer from Ladbrokes Casino allows the player to try out their favourite Games without risking their wallet. Step 1: Register using the button below. Step 2: Once registered, press the green “Claim now” button below. Step 3: Once you've received a confirmation email you can log into your account and play your £5 Free! The promotion will begin at 12.00 GMT on Monday 2nd July 2012 and ends at 23:59 GMT on Friday 30th September 2012. This offer is only available to new customers who open and register a real-play account during the promotion period (specified above). Once registered the customer must claim the £5 free bonus via the claim form on the promotion page. This offer is also open to existing Ladbrokes customers who have never played Casino before, to redeem this offer existing customers need to fill in the claim form above. Only new customers residing in UK and Ireland are able to qualify for this free chip offer. This free chip offer can only be claimed once per customer, per household, per shared computer and shared IP address. Customers registering multiple accounts and claiming multiple no deposit bonuses will result in NO accounts being credited. New customers registering after the above end date will not be eligible for this free chip offer. Providing all criteria are met the free chips will be credited to the customer’s account within 48 hours and a confirmation email will be sent to all qualifying players. The £5 free play bonus will expire 7 days after being credited. The £5 free play bonus must be turned over 40 times before any winnings can be withdrawn. 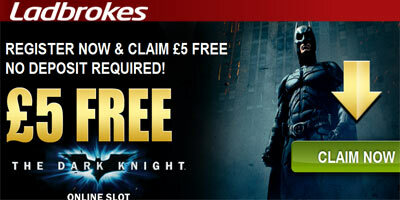 "Ladbrokes Casino: 5 pound free on The Dark Knight online slot (no deposit required)"